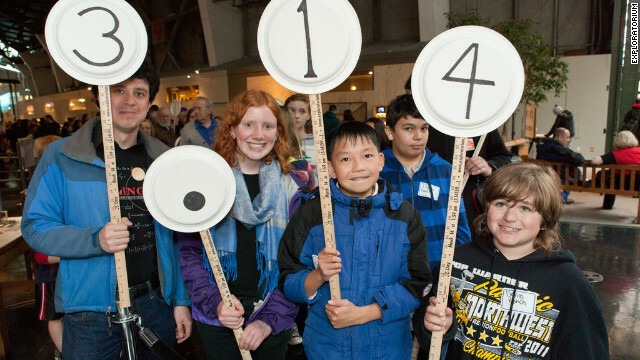 Young pi fans prepare for the Exploratorium's annual parade, holding handmade signs. Happy Pi Day, everyone! Pi Day honors the number pi, the ratio of circumference to diameter of a circle, which is approximately 3.14. It is also Albert Einstein's birthday. And it sounds like "pie." It's hard to know who was the first person who decided to bake a pie on March 14. These days, there are celebrations worldwide - on the Internet, in schools and among friends who like to eat sweets. But the San Francisco Exploratorium takes credit for the first Pi Day in 1988. The day was "founded" by Larry Shaw, who worked in the electronics group at that time. The Exploratorium is going all out for its 25th anniversary of pi parties. It just so happens that the museum is moving to Pier 15 next month. Thursday, in front of its new location, the museum is unveiling a circular "pi shrine" where Pi Day will be celebrated. The shrine consists of a pi symbol with digits spiraling around it that will be embedded in the sidewalk. "Kind of like in Hollywood where you plant the hands and feet of celebrities, we’re going to put pi right out there in front of our open doors and celebrate the fact we’re relocating to this place," said Rob Semper, executive associate director at the Exploratorium. Everyone who comes gets a number from zero through nine, and can line up for a parade of digits, in order of pi (i.e. 3.1415926535...). The number of digits can get into the hundreds, depending on how many people come, Semper said. Over the years, the event has grown from a small gathering with mostly museum staff to a public extravaganza, with sometimes a couple thousand people. Of course, there will be fruit pies and pizza pie. Also, according to museum staff, a local couple usually brings their son, Pi, to the event. If you're in San Francisco and want to check it out, here's more info. Pie is good, but that still doesn't mean the United States ever landed on the moon. I agree with Cal. My fav is blackberry or raspberry cobbler. And pumpkin pie with cool whip on it. And key lime pie. And lemon merangue pie.